Disclaimer: It you have not heard of The SUN, I beg you to just take a look at the website. This slim magazine is a gift from an era almost lost today. The black and white photography is stunning, shocking and sometimes just not my cup of tea. The articles are short but so well written, I find myself underlining and dog-earring every issue. There is no advertising, that’s right, none. I am never bombarded as I flip the pages from poetry to Reader’s Write with incongruous ads. 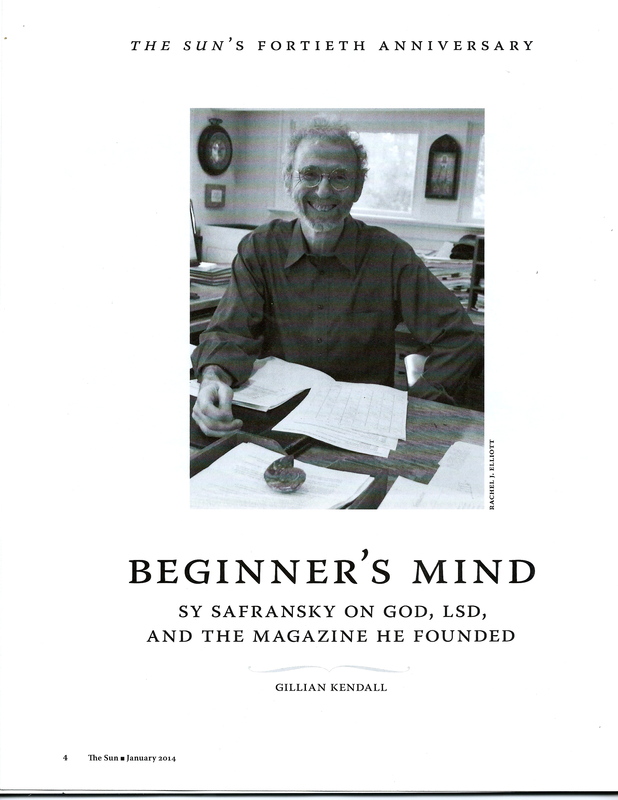 The most recent issue was the 40th anniversary of the publication. Sy finally agreed to be interviewed. You can read it here, and I can’t suggest strongly enough that you take five minutes out of your day. We all need to stop and just listen sometimes. The article spoke to me on many levels as I move through this phase in life. I felt the need to write back to Sy but also felt the need to boldly promote this man and his magazine. My mother was a huge proponent of “Great Books of the Western World.” I remember well the nights she rushed off to her Great Books meetings, as well as “The League of Women Voters.” I grew up ten years behind you but share much of how life was evolving then. I wanted you to know the influence your publication and this particular interview have had on my view of life and how we communicate it. I always knew I would write. The stories and images cluttered up my mind until I leaned to write. I put those cursive letters, (so lovingly practiced as they danced above the blackboard – pure white wisps on a sea of green) into just the right order to form the words for me. Unlike you, I pursued my addition in private, (OK, bad attempt at a pun) keeping locked diaries as a child and volumes of journals as a woman. Now, as a mother, sister, daughter and twice ex-wife, I write it all down digitally, that it may live until the next technology upgrade. My penmanship has suffered. This I know, because I still attempt to write it down “old school” from time to time and it is mostly illegible. There were two paragraphs in your letter that I highlighted, underlined, then put a little star next to. Towards the end you spoke of failure; of marriages and magazines. If I may quote you here: “Still, that doesn’t mean they’ve failed. As Hermann Hesse wrote, ‘Some of us think holding on makes us strong, but sometimes it is letting go. '” This should be plastered on everyone’s iWhatever as the screen saver. If I look at letting go as failure, it will be. The other paragraph was the very last where you talked about the balance of work/life of The SUN and what the next life might bring. It was brilliant. May you find that perfect day in Yankee Stadium! Thank you for what you have given. This entry was posted in writing. Tagged communication, life, life challenges, Sy Safransky, The SUN, unemployment, writing. That was quite an interview! Interesting read! It is an amazing magazine and a bargain at $35 a year. I am always so excited when I see it in my mailbox. Thanks Terri, so glad Laura introduced us. I love following your adventures. As to The SUN, I only found it a year ago and look forward to every issue. So rare to find such a pure publication. He did a writer’s workshop at the Rowe Center last June and I didn’t feel I could afford to go. Kicking myself now for missing the opportunity to meet him. I really do love the magazine. There are some issues that don’t necessarily intrigue me, one that comes to mind had a theme on prisons and prisoners. But I am never left without lots to think about, whether I agree or not. It is a bargain at any price.